Clean, sheer, and physically demanding, Reed?s Direct is a respected climb even for 5.12 climbers. 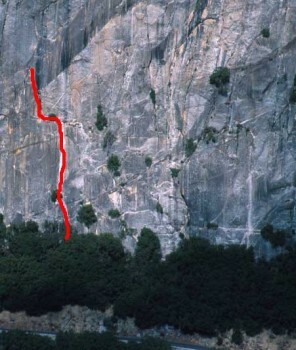 The crux second pitch is fun, spectacular, challenging, and draining ? a test of power, endurance, and technique. The route is not tall, but by starting 1500? up the wall of the Valley, and by its location across from the spectacular Rostrum, it feels like you are much higher than you are. The final pitch is a testpiece 5.10a flared offwidth, but a super-fun tunnel through and 5.9 crack allow you to reach the top and top-rope the 5.10a offwidth from bomber bolts. Which SuperTopo guidebooks include a topo for Direct Route?